2019 Habitat for Humanity Affiliate Conference [Booth #114]. Come meet the team! Convert, grow and tap into your Nonprofit network. Nonprofit Donate Button: Custom branded mobile-friendly donation pages. Over 20% of donations are made online. Convert your nonprofit donors, volunteers and supporters into lifelong donors. Giveffect’s donor management systems allows your team to collect, track and manage any type of donation. We take care of the rest. "How much has Giveffect helped your nonprofit increase fundraising revenues?" Giveffect becomes your nonprofit donate button. Custom brand each donation page. Track any type of data you wish. We automatically send out your custom thank you letters and issue tax-receipts on your behalf. Design your donation pages with one-time and/or monthly recurring donation options. Giveffect’s donor management system will automatically charge their credit card each month. Do your donors prefer pledge installments over monthly recurring donation plans? Our donor management system allows your team to design the pledge installments in any way you wish: flexible dates and flexible amounts due. Each donation is a donor investment towards your nonprofit’s mission. Add descriptions to each donor tier and build insightful relationships with your supporters. 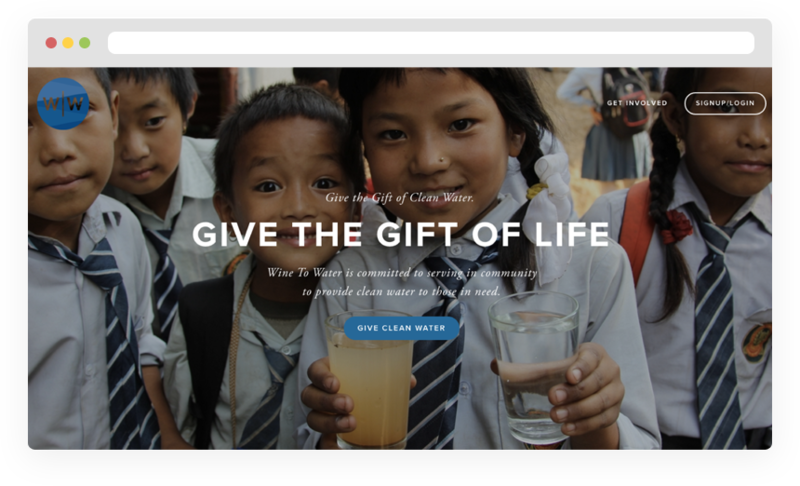 Track all donor gifts with Giveffect’s donor management software. Logged donations will automatically be entered into the database. Track donor: cash, checks, in-kind items and services, bitcoin, securities and more. Supporters may make donations simply by sending an SMS Text message from their mobile device to your dedicated phone number. Create specific keywords for your campaigns and auctions to track analytics and A/B test your marketing channels. Nonprofit Donor Management Automation: We do the busy work for you. Automated data entry, issue personalized tax-receipts, send out tailored thank you emails and more. Giveffect’s automated donor management software automatically logs and enters all donor records into the constituent relationship management database. Your nonprofit business office, development director will no longer have to manually do this again! When donations are made online, tax-receipts branded to your nonprofit organization can be sent automatically to your donors. Nonprofits can customize thank you emails with Giveffect Email Marketing System that’s integrated with our donor management software. Tailor each message based on your donor’s name, amount donated, fundraising campaign name and more. Log offline donations into the donor management software, and Giveffect’s nonprofit software can auto generate a branded tax-receipt for print and email. Log offline donations into Giveffect’s donor management software, and send out custom thank you letters to your donors by email or print! Nonprofit Email & Direct Mail Marketing: Build strong constituent relationships. Giveffect’s donor management software allows you to send out newsletters, direct email and letters for print. Analyze the ROI of each outreach program with real-time data analytics and reporting tools. Keep donors engaged with your nonprofit updates. Giveffect’s donor management software enables you to send out newsletters to all constituents by group, fundraising campaign and more. Integrate your SparkPost or MailChimp account. How effective was your newsletter or mass direct email campaign? Nonprofits can see the correlation between their message and the donor conversion rates per fundraising campaigns. Reach out to your donors, volunteers and constituents by email. 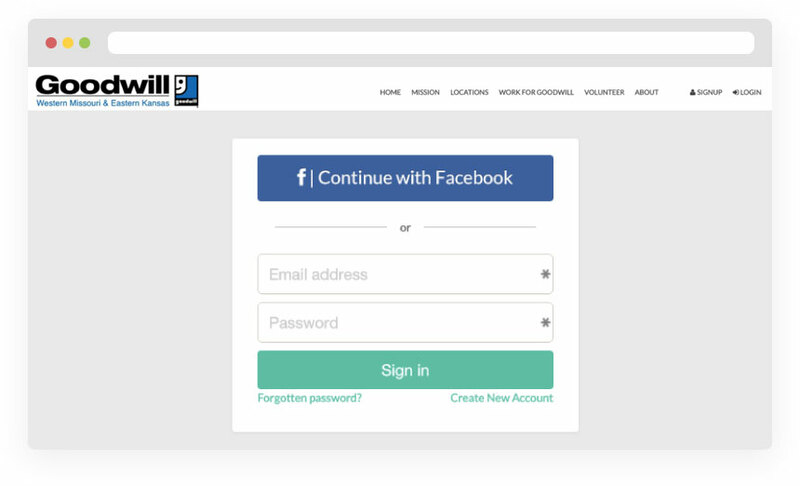 Our email marketing tool allows you to pre-create email templates and send them to individuals, groups or everyone from a fundraising campaign in your database. Send thousands of the same email or letter, personalized to your donor’s name, from Giveffect’s backend direct mail marketing system. Want to wish the “Smith Family” or “Mr. & Mrs. Smith” with one printed letter? You can group donors and all constituents by household, and send one letter to the whole family. 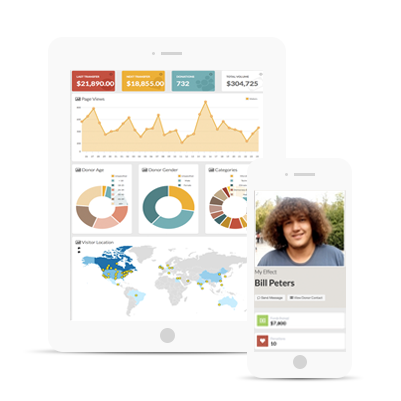 Nonprofit Real-Time Data Analytics & Donation Reports: Dashboards and more. Donor data is automatically entered into the constituent relationship management database. We take care of data entry, nonprofit administration Quickbooks accounting reports - and more. Save yourself 30 extra hours per month of manual entry and raise 32% more funds. When you log into the Giveffect’s constituent relationship management database, you’ll get access to your donors’ full donation summary, along with their event participation, fundraising, volunteer history and more. Nonprofits get access to pre-prepared donor management reports to help teams quickly see donor’s lifetime summary, health and more. Nonprofits can customize reports based on the fields they track in Giveffect’s the donor management software, by fundraising campaign, donation button and more. Nonprofits can schedule and receive donor reports in their email inbox. We translate data from our donor management software into beautiful graphs and charts to help you make better decisions for your nonprofit. It's hard to make sense of all your big data. Our system will crunch the numbers for you so your team. We help you make better and quicker decisions. Track all the custom fields your nonprofit requires to update financial reconciliations. Your nonprofit can generate this in Quickbooks format or re-arrange the excel export file. Donor Management Portal: Your donors get what they need, when they need it. Donors can Start a Fundraisers, join a Peer-to-Peer fundraising event or participate in a team fundraiser. When they donate, they can manage their recurring donations and download their tax-receipts. Your donors and constituents can opt-in for their very own donor profile. When they donate to your nonprofit, their information will be accessible with a Facebook login or Giveffect’s single sign-on. Your donors can get access to all their online and offline tax-receipts. They simply have to login and download them. Nonprofits no longer have to pull-up tax-receipts from their files. Giveffect allows donors to start their own fundraisers, join a peer-to-peer fundraiser, friends-asking-friends and team fundraisers. By logging in, they can manage their very own fundraising page. Donors can login to manage their monthly recurring donations. Nonprofits can award social badges to donors, volunteers and constituents through Giveffect. These awards will appear on their profiles. "We are using Giveffect to manage our database of contacts, our donor relationships, our fundraising efforts, and our volunteer engagement. We’re using Giveffect as a one-stop-shop for our entire ministry - from Family Partnership to Partner Family Mortgage Management to Community Outreach/Volunteerism to Marketing and Communications. We were in much the same situation as many nonprofits - using a dozen services that we had to reconcile together (and pay for separately). We were missing out on engagement opportunities left and right because data was everywhere and making sense of it all collectively was a seemingly impossible task." Engage with your donors in the new Giveffect way. See how nonprofits are using Giveffect as their donor management software. Thank you for contacting us! A representative will be in touch with you shortly to discuss your inquiry.